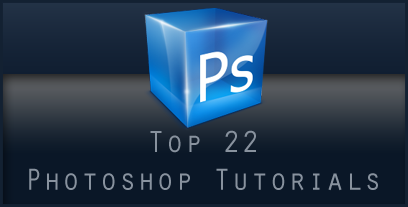 After my post about top 22 CSS tutorials, now I give you a collection of my top 22 Photoshop Tutorials. You can learn a lot from these tutorials and you can create really nice art. Please take note that these tutorials are not very hard, but not for beginners either. Oh, and don't forget to check out the Ultimate Photoshop Design Resources which can help you a lot when creating nice art in Photoshop. Good luck! In this Adobe Photoshop tutorial, we're going to learn how to create a collage of "warped" photos. Now, don't go letting your imagination run wild here. When I say "warped", I don't mean "sick, twisted and shocking", unless of course those are the types of photos you want to use. What I'm talking about is photos that we'll be bending, curling, distorting and reshaping using Photoshop's Warp Tool. This tutorial should step you through making a simple, yet realistic-looking planet using Adobe Photoshop, and ONLY Adobe Photoshop. We're working small here, so keep in mind that the larger you work, the harder the planet will be to create (just a bit more work as size increases). In this Photoshop photo effects tutorial, we're going to learn how to take a single photograph and turn it into a collage of polaroids, with each polaroid containing a small section of the overall image. You can use this effect with lots of different types of images, whether it's a photo of one person or several people. It's great for photos of family or friends, vacation photos, or even as a creative effect for wedding photography. One of the best sites around for desktops has to be Desktopography. Inspired by their amazing work today we are going to put together a sunset image mixing some vector shapes and dusky lighting effects to produce a slick image that would make a nice album cover for a chillout mix! Over the years I have seen a number of Photoshop fire effects. Unfortunately, they were not very flexible or realistic, so I decided to develop my own. The technique I came up with was more realistic than I had hoped for. It can be used to start a fire on almost any image. This tutorial will show you how to take an eye and make it look beautiful. Tons of people asked me to make a tutorial for line art and coloring in photoshop, so here you go. This tutorial will cover the process of creating a toon based on Veilside's Fortune RX7. Create your own Pirates of the Caribbean looking like Posters. Right time to go into Photoshop and create a "simple" moody image using loads of simple effects to create an image with depth and composition. This is simpler than you think but can demand a lot from your system. There are many instances when you will want to simulate or mock up how a design would look printed out and photographed. It might be for a portfolio piece, it might be for a client to help them imagine a concept design or it might just be for your own satisfaction at seeing how your work is going to look to the end user. Half robot, half frog. In this tutorial, I am going to show how I took a regular frog and opened him up to reveal a mechanical skeleton. In this tutorial is written how to create a very cool looking mini-super car with bodypaint using Adobe Photoshop. Grab a picture of a supercar and get ready to minimize, colorize and bodypaint it. Pimp that ride! Super Airbrush tutorial. Make a picture look like a supermodel. AHHHHH! Oy! Alien Invasion! A Photoshop Tutorial to create a realistic looking alien invasion. This tutorial lays out the basic methods I use to draw mostly straight or slightly wavy hair in Photoshop. In this Adobe Photoshop tutorial, we're going learn how to add reflections, or at least, different reflections, To Sunglasses. Do you have some favorite Photoshop tutorials on your own?